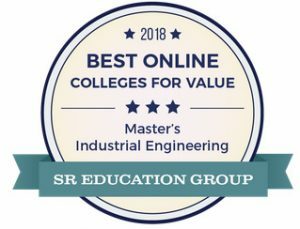 The master’s degree in Engineering, Industrial Engineering concentration earned the number 10 ranking in the nation for the “Online Masters Best Industrial Engineering Degree Programs 2019” and the number 12 ranking in the nation for the “2018 Best Online Colleges for Value” from the SR Education Group. 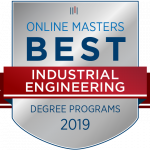 Undergraduate Education Engineering, engineering technology and science degrees preferred. Other majors accepted if the applicant has technical work experience. Acceptance based on GPA and GRE. Open to all majors, including engineering. Admission decision based on GMAT or GRE, and undergraduate GPA BS degree in engineering required. Acceptance by GRE, or combination of GRE and GPA. Work Experience Designed for engineers desiring advancement or skill enhancement in technically oriented business or engineering fields at any time in career. Designed or individuals in all industries desiring managerial advancement, at any time in a career. Designed for engineers desiring advancement or skill enhancement in technical fields early in career. Students enrolled in the online section (V84) of a class are responsible for finding a proctor. Students enrolled in the online section may take the exam with the on-campus section of the class. Students enrolled in the on-campus section of a class must take the test on campus with the class. The student must use an official testing center (either independent or associated with a university or college) as a proctor if there is one located within a 40-mile radius of the student’s home. If an official testing center is not available, students may use a public or college librarian that offers proctoring services. Any exception to these rules for picking a proctor must be approved by the course instructor, ETM Proctor Coordinator, and ETM Program Coordinator. Students must identify a proctor and gain preliminary approval of the proctor from the ETM Proctor Coordinator by sending the completed Proctor Information Request form in an email to the course instructor and ETM Proctor Coordinator. The Proctor Information Request form will be provided to the student by the course instructor. This form must be submitted by the 14th calendar day of the quarter (or earlier if specified by the course instructor). After the student gains preliminary approval of their proctor, a Proctor Agreement Form and Scheduled Test Times (to be completed by the proctor and student) will be e-mailed to the proctor by the ETM Proctor Coordinator. Students are responsible for contacting the approved proctor and setting up a time to meet with the proctor, sign the form, and schedule an appointment (i.e., a beginning exam time) on the designated exam dates. These forms must be completed and returned to the ETM Proctor Coordinator by the 21st calendar day of the quarter or 1 week prior to the first exam (whichever one is earlier). Students are responsible for taking scheduled exams on the scheduled date. The student will show a driver’s license or other government-issued photo identification to the proctor. The student can take the test on an alternate date if it is approved by the instructor. Proctored Testing Guidelines for Proctors An appropriate proctor is an impartial individual who will have no conflict of interest in upholding Louisiana Tech University’s Academic Honor Code. The Academic Honor Code can be viewed at Academic Honor Code. Confirm all necessary technologies are available and working. Monitor students during test taking. Ensure exams are completed according to the instructor’s directions. Return exams to the ETM Proctor Coordinator as soon after the test is completed as possible. Only the proctor may handle the actual exam prior to and following its completion. No copies of the exam other than the copy used for test taking are to be made at any time. No person other than the proctor and student may view the exam. The student may have access to the exam only during the time period allowed by the instructor. The proctor must follow the instructor’s requirements for administering the exam. These may include a time limit, specific permissible materials such as a calculator, an inclusion or exclusion of books, notes, etc. The proctor will check the identification of the student based on the student’s driver’s license or other government-issued photo identification. Students are not permitted to leave the testing area once the test has begun. No phones, book bags, or purses are allowed in the testing area. Students are not allowed to take the test if they miss their scheduled test time, schedule an inappropriate test time, or leave the testing center during the test. Prior to the scheduled exam start time, the exam and cover sheet containing specific instructions for the exam will be emailed to the proctor. The proctor must return testing materials with the provided cover sheet via email to the ETM Proctor Coordinator. After successful submission of the exam to the ETM Proctor Coordinator, the exam and all accompanying materials are to be destroyed. A working email address associated with the testing center or library. Computer with Internet access and the ability to download documents in .doc (Microsoft Word) and .pdf (Adobe Acrobat) format. Louisiana Tech is one of the few Universities that uses the quarter system. This means that instead of two semesters and a summer session, the year is broken up into 4 quarters: Fall, Winter, Spring, and Summer quarters. The academic calendars for Louisiana Tech can be found here. It is important to note that the quarter system changes the typical course hour load for a full-time student. For example, a graduate student is considered a full-time student when enrolled in 6-course credit course hours. What Are the Registration and Tuition Payment Deadlines? Registration dates vary quarter to quarter and can be viewed here. Payment deadlines change each quarter as well and can be viewed here. The Bulldog Online Student System (BOSS) is a Tech-modified system that allows students to view their student records, register for classes, and complete fee payment over the Internet. To access your account, visit BOSS, and for more information please see the Registrar Office page. Once classes begin, Moodle gives you access to the classes you are currently enrolled in. Professors take liberty as to what they upload to their course section but generally, this is the place to view information such as course documents, homework, and course grades.